Mandala rock painting is a technique that many people are intimidated by, including me. 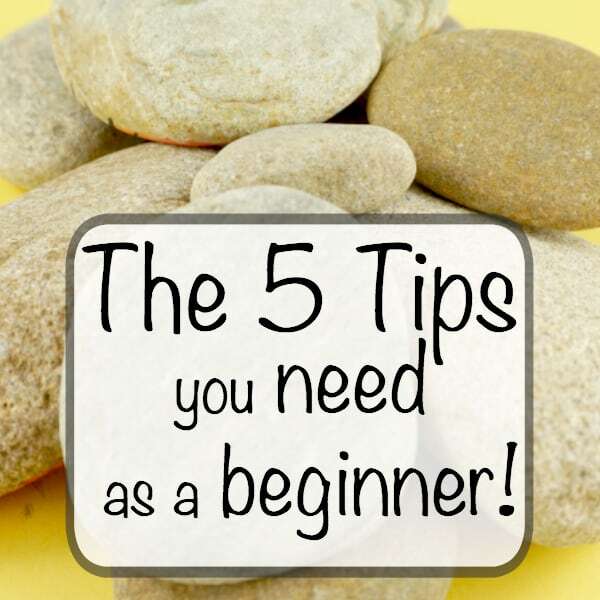 I’ve come up with some tips that will help us beginners tackle the art of Mandala painting. I even found an easy hack to make spacing a breeze! Mandalas are intimidating… especially as a beginner. Mandala rock painting is a style that so many people do, yet I haven’t given much effort to. I think the end result is beautiful, but my hands aren’t that steady and the fact that one mistake can stand out like a sore thumb just gets me antsy before I start. I decided I need a little help… I created a fun hack to help give me a good starting point so I could attempt a dotted mandala and I’m happy to say, I think it was successful. Check out these dot painting tips for beginners! To get my spacing correct, I started with a paper template. I believe that this mandala hack is what makes the difference for us beginners. So much of this technique is spacing and getting the dots to line up. 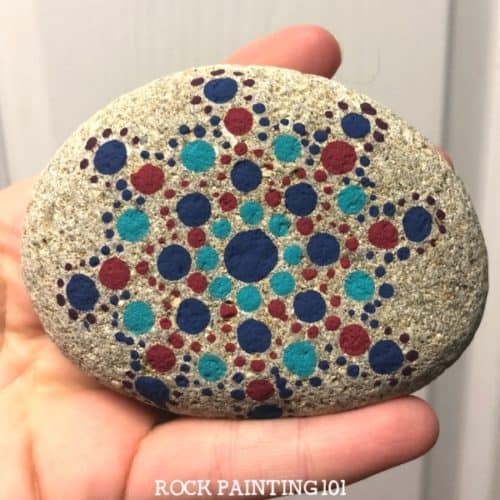 This simple trick was a game changer for my mandala rock painting. Grab acrylic paints like the ones I used here. Here are the instructions for the hack I use to create mandalas. Please watch the video at the end to see it all in action. I started with a post-it note. Any square piece of paper will do. Fold it into a triangle. Then to a smaller triangle. Then one more time. 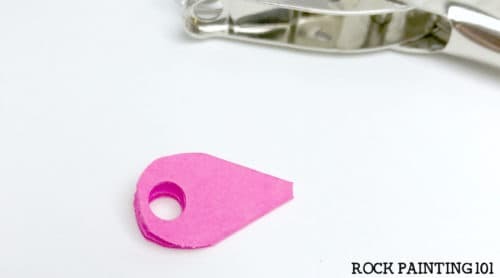 Use a hole punch and put the center point in the center of the punch, and punch. 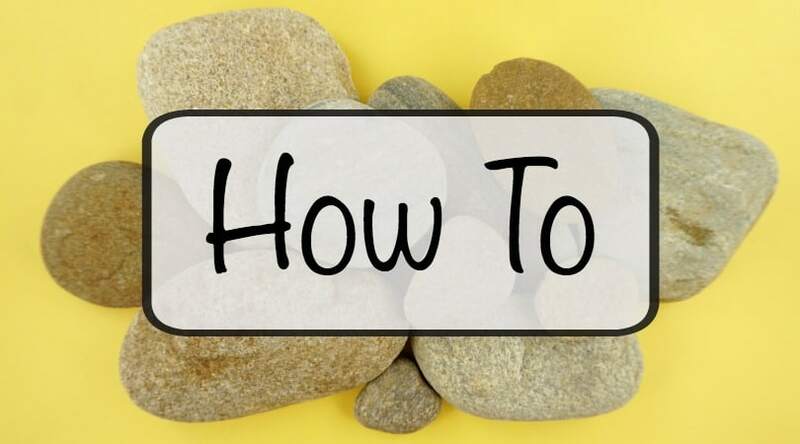 Place the center of your template onto the center of your rock. Find the spot where the farthest dot will be. Make a note on your triangle and then punch a hole at that spot. You want the hole to be equidistant to either side of the triangle. 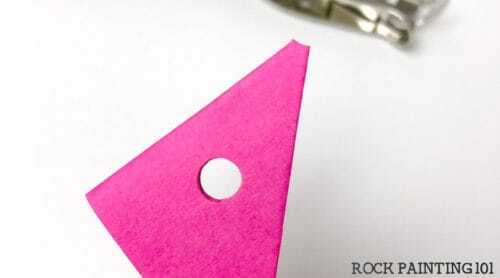 Cut down your triangle so that you have the center and the hole and the leftover triangle is gone. Unfold the template and use the circles as your spacing guide. 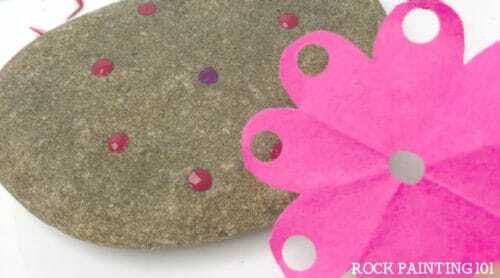 Hold your template on your rock while you create dots in each hole. Now that we have our basic shape, we can start our simple mandala design. 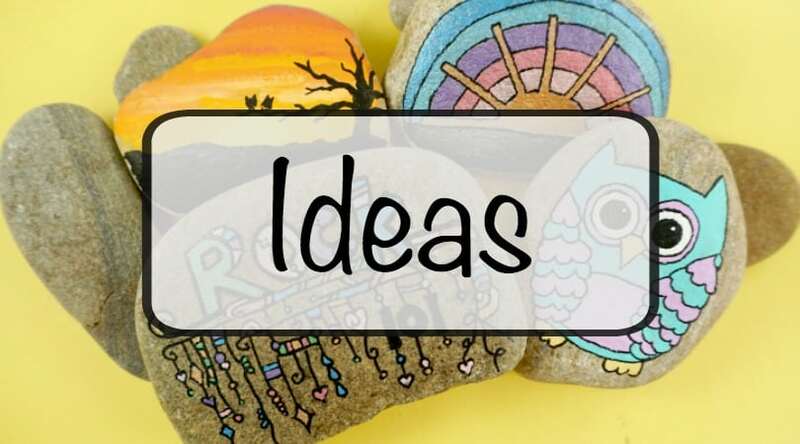 Looking for more rock painting ideas? Get inspired here! 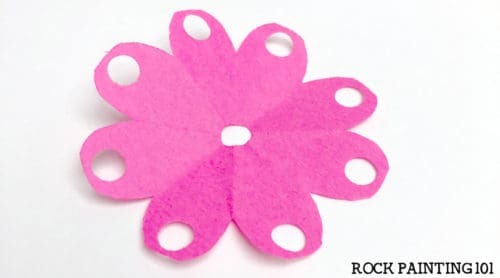 If you want your center to be bigger, go ahead and use a bigger sized dotting tool to make it bigger. I like to start my Mandalas from the center dot and work my way out. So I will make my next row of dots. Using the exterior dots as your guide, place a circle of dots around your center dot. Keep creating new dot patterns that repeat all the way around your center dot. Remember to continue to use those exterior dots as a guide. When creating smaller dots, get some paint on your dotting tool and press down. If you keep creating dots, each dot will get smaller until you get more paint onto your dotting tool. In my picture and the video below, my rock doesn’t have a base coat. 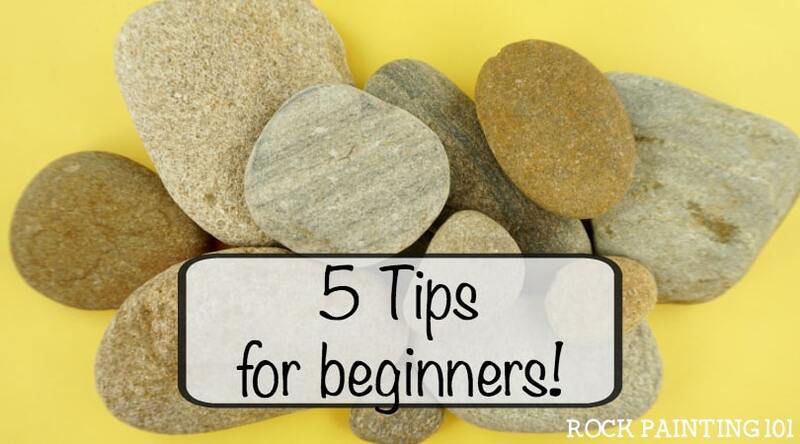 But having a base coat on your rock will make your design pop out. 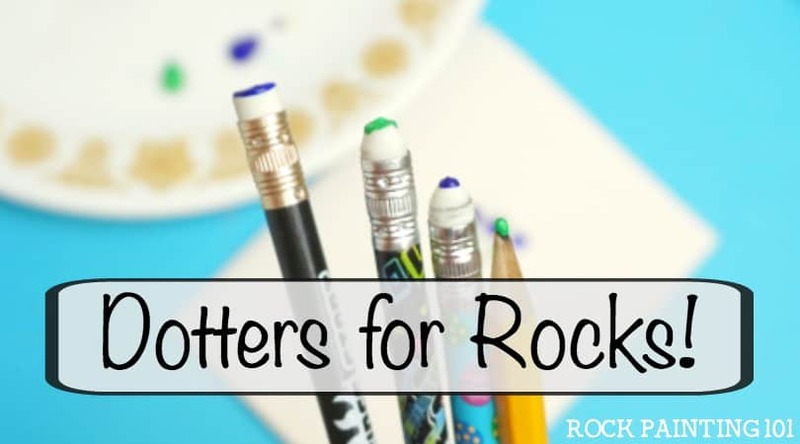 Check out these tips for giving your rocks a quick and inexpensive base coat. 101 Tip! : If you are getting peaks, or bumps, in your dots; try adding a small bit of water to your paint. It may be that your paint is just too thick. Just keep working your way around your rock, repeating your patterns. Mandala rocks take a lot of patience and time to create. I am not a master of mandala painted rocks, but each rock that I create I get better at. 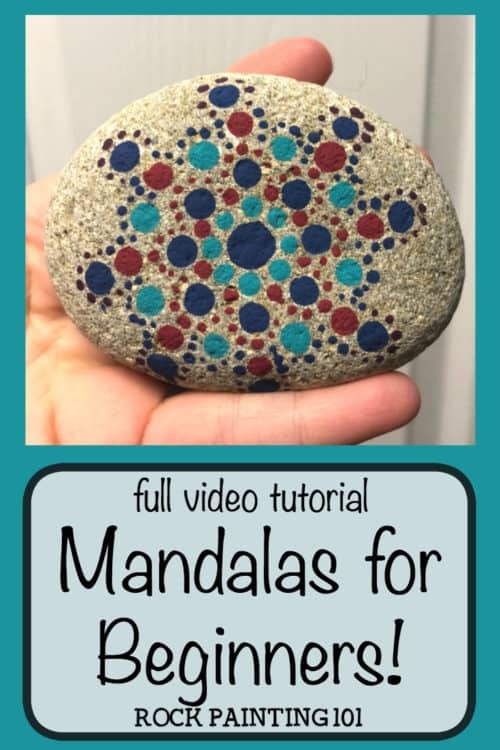 Hopefully, with these tips, you’ll become more confident and will create a stunning mandala rock! 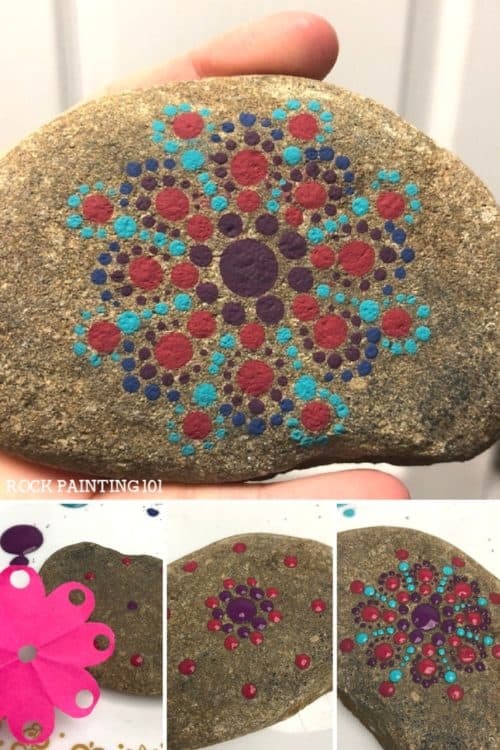 How to make a Mandala on a rock! Pin this Mandala rock to your favorite Pinterest board!